The end of this epic Chilean-Argentian city adventure is coming to a close. Would I go back? Definitely! I also want to go to Patagonia and do some backpacking and eventually visit some of the ski resorts in either country (when I’m more advanced) so I know I will be back to both of those lovely countries. Just to recap: Lindsey and I used Santiago as our entry and exit point for this trip because it was cheaper to fly to Santiago than it was Buenos Aires. In hindsight, this was fine, but I do think we might have had more energy at the end if we’d visited the cities in reverse. Buenos Aires is super busy and huge, so doing that first might have been the best. Then we could have slowed down a little bit in Mendoza, then really slowed down in super chill Valparaiso. BUT, I don’t regret our choices at all, we still managed to see and do so many points of interest. I am merely making that suggestion for others. That said, we arrived in Santiago late on a Sunday evening, waited in the LONGEST CUSTOMS LINE ever (well, until that point in my life anyway, lol) and then had a pre-hired driver to take us to our hotel, the Intercontinental Santiago. That hotel was your standard business hotel and was nice but nothing over the top fancy. I sound so snobby for saying that but we had just come from the Park Hyatt BA and Park Hyatt Mendoza. The latter is where we scored the governor’s suite and it was insanely spacious and nice. Anyway, we got in so late that we dashed to the bar to eat dinner before they closed the kitchen at 11 pm (and it was fine) and then went to bed. And then, we slept until 10 in the morning the next day. That hotel was quiet, had phenomenal blackout curtains, and we were apparently exhausted. We only had plans to see a few sights that day, since our flights were at 8 pm. And so the first order of business was coffee, then we strolled a through park, some plazas, went to the top of a hill to see Santiago from its highest point, and then had our last South American meal at a place that specialized in pisco sours, empanadas, and other local cuisine. Chipe Libre - We searched for one good place to eat that was most representative of the region and Chipe Libre delivered. It was a delicious blend of Peruvian-Chilean cuisine with a lot of fun pisco sour options. We shared some empanadas and I ordered some kind of Peruvian corn/ancient grains/vegetable dish which was really really delicious. I live in Illinois and I don’t really like corn (which is kind of unheard of), but the corn in Chile was huge and amazing and I would eat it every day. I ordered a classic Pisco sour here and Lindsey ordered a pisco flight. Both were fantastic. The ambiance of Chipe was great, the servers were very knowledgable and friendly and they had really great outdoor seating, but we wanted to sit indoors since we didn’t want to board our 24 hours of flights home as sweaty messes. Normally, I’d be all over outdoor seating. 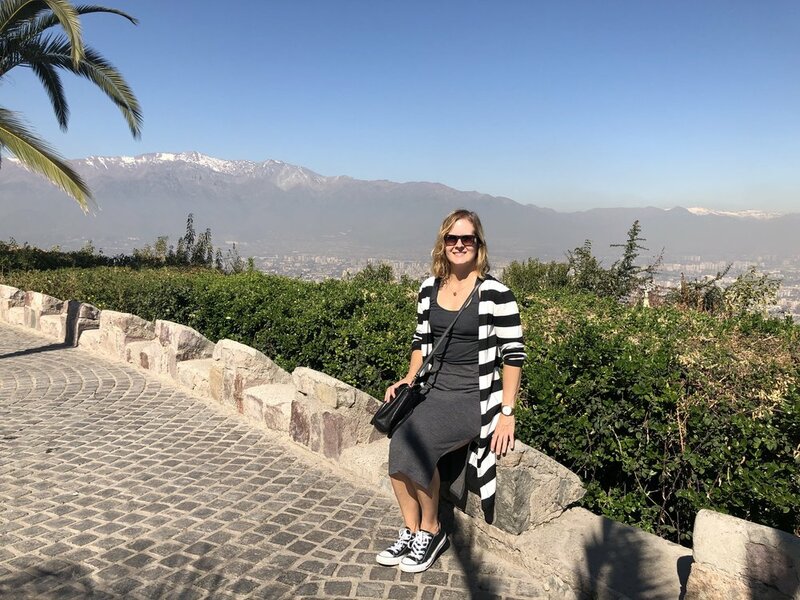 San Cristobal Hill - This is where we soaked in the sun and the stunning views of Santiago! You can hike up here if you want (it would have been a great urban hike at 880 m/2890 ft above sea level)! For the sake of time (and not being sweaty messes) we planned to take the funicular - but it was not running that day, so we took the shuttle bus up and down instead. So there you have it, a very brief visit in Santiago that gave us a tiny taste of the city. I would love to go back and explore more - it was huge. It did feel a bit more laid back than Buenos Aires (to me). I’d love to hear someone else’s take on that. I’m going to take a brief pause from trip diaries this week (Wednesday) to reflect on some recent weekend trips. Then, next week I’ll start all of my Tanzania/Kilimanjaro/Zanzibar/Kenya posts. I am as excited to write this and go through photos again as I am for anyone to read them. I’m hoping to wrap up Africa before I head to Vancouver in early May and then trip diary Vancouver/Whistler and my quick trip to the UK in May and June. I also have at least one guest post in the works on a topic that I don’t think I’ve ever read from anyone else, and I’m excited for my friend to share it. At the top of the cerro (hill) that overlooks Santiago and towards the Andes. Delicious lunch at Chipe Libre. Pretty gardens we walked through in Santiago before our late lunch at Chipe Libre. Now do you see why I mentioned in a much earlier post that it reminds me of Los Angeles? The cutest coffee and Chilean flag cookie. Urban sprawl and hazy Andes mountains in the distance. Lunch menu at Chipe Libre. Lindsey in some pretty gardens. We found United States Avenue. This post wouldn’t be complete without a cute Chilean canine.